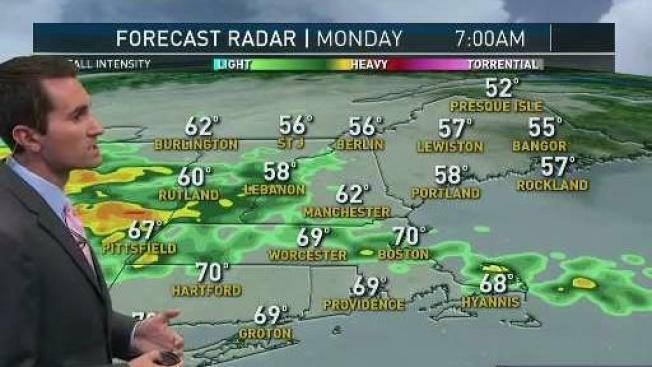 A quick moving line of rain is moving through New England this morning. The rain will be most widespread before lunch, and will contain some localized downpours. After about 1-2 p.m. that band of rain will move offshore and we’ll have a drier afternoon with just a spot shower here or there. Highs during the day will be in the 70s, and even close to 80 in some spots where sunshine develops. Sunshine will be most widespread during the afternoon in Vermont, New Hampshire, and Maine. Expect more clouds farther south. Everyone will also be very humid, and windy. Another batch of rain arrives on Monday with the remnants of what was once Hurricane Nate. One band of light to moderate rain will lift into New England during the morning. Then around midday we get a break in the action, with just lots of clouds, some drizzle, and a few light showers for most. Another area of rain, this one with embedded downpours, arrives late in the afternoon and at night. When it’s all said in done many will end up seeing 1-2" of much needed rain this weekend. There still could be a shower early on Tuesday, but sunshine will return during the day as humidity drops and highs again soar close to 80. Wednesday will feel more fall like with highs in the 60s and comfortable humidity. We’ll stay cool, with highs around 60, late week as a few spotty showers try to return.